The Food Network's Rachael Ray knows comfort food, and her carbonara recipe is exhibit A. The chef recently shared the crowd-favorite recipe on her Facebook page, garnering nearly 625 likes and 318 shares in a few short hours. If the comments are any indication, it's one of Ray's most adored recipes, and it's easy to see why. "This is a favorite late-night dinner for my husband and I," she writes on her blog. "It's really like an early breakfast, with pasta rather than potatoes or bread. It is, after all, bacon and eggs." Heat olive oil, three turns of the pan, in a large, deep skillet over medium heat. Add pancetta or guanciale, brown three to four minutes, add garlic and some black pepper, and stir two minutes more. Add wine, and reduce heat to low. Whisk up egg yolks, and season with salt and pepper. Add pasta to salted boiling water and cook to al dente. Add 1 full cup of starchy cooking water to egg yolks in a slow stream to temper them. Reserve an extra 1/2 cup starchy water in case the pasta gets too tight when you toss it. 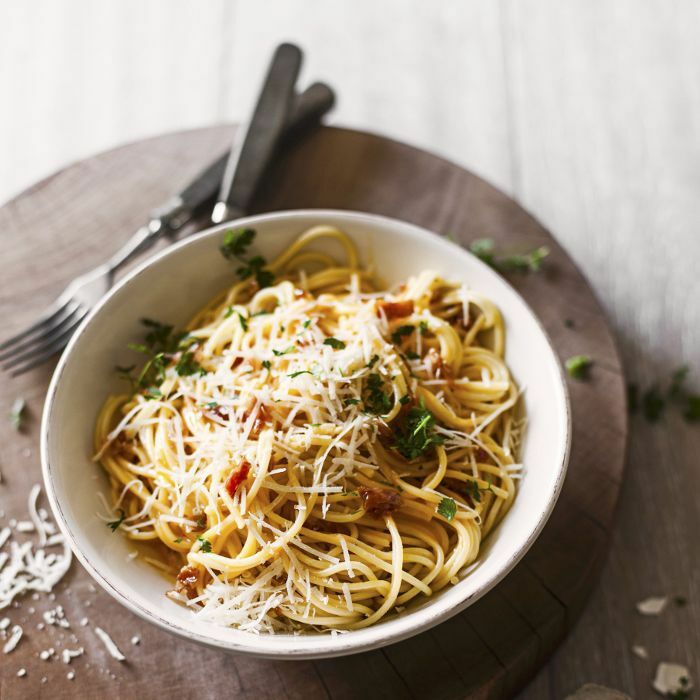 Drain pasta and add to pancetta and garlic, remove from heat, and toss with egg yolks and handfuls of grated cheeses, parsley, and adjust salt and pepper to taste. Next up: This crockpot recipe has been shared 500,000 times (it's pure comfort food).